Something special is happening: Councils across SA are standing up for those out of work, by calling for Newstart to be raised. 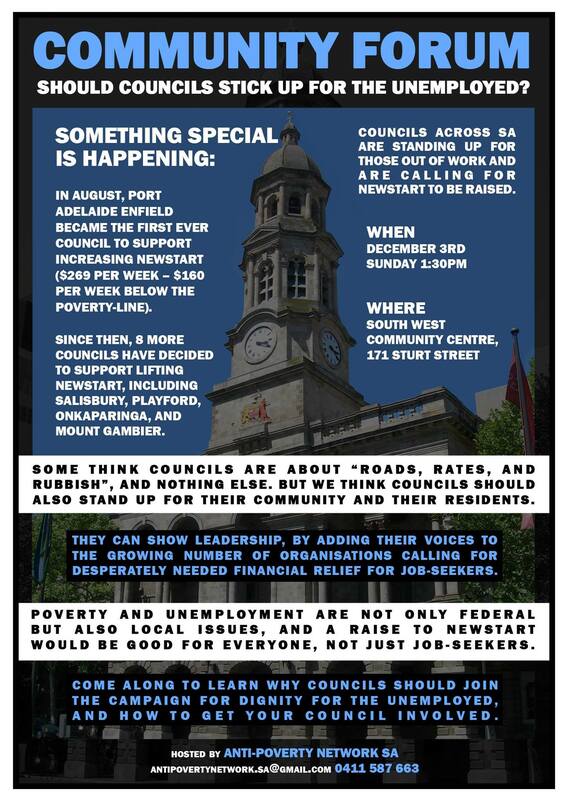 In August, Port Adelaide Enfield became the first ever Council to support increasing Newstart ($269 per week – $160 per week below the poverty-line). Since then, 8 more Councils have decided to support lifting Newstart, including Salisbury, Playford, Onkaparinga, and Mount Gambier. Some think Councils are about “roads, rates, and rubbish”, and nothing else. But we think Councils should also stand up for their community and their residents. They can show leadership, by adding their voices to the growing number of organisations calling for desperately needed financial relief for job-seekers. Poverty and unemployment are not only federal issues – they are also local issues. A raise to Newstart would be good for everyone, not just job-seekers. Come along to learn why Councils should join the campaign for dignity for the unemployed, and how to get your Council involved.